With the U.S. federal water red snapper season only hours old this past Sunday, June 1, the U.S. Coast Guard was involved in an interdiction with a Mexican fishing crew found poaching the species off the coast of South Texas. According to a U.S. Coast Guard news release, the operation began after an Air Station Corpus Christi air crew spotted a 25-foot Mexican fishing boat - also known as a lancha - just after the midday hour some 30 miles offshore and 70 miles north of the U.S./Mexico border. That prompted the launch of a Coast Guard air crew aboard a MH-65 Dolphin helicopter stationed out of Corpus Christi along with a 33-foot Coast Guard law enforcement special purpose craft (SPC-LE) launched from the South Padre Island station. The crew of the 33-foot SPC-LE eventually stopped the lancha and its crew of four around 2 p.m. at a location approximately 33 miles north of the international border. According to the Coast Guard, the Mexican vessel was actively fishing without a legal permit in U.S. waters and had caught some 450 red snapper. The poached snapper were all dead and packed on ice according to the agency. 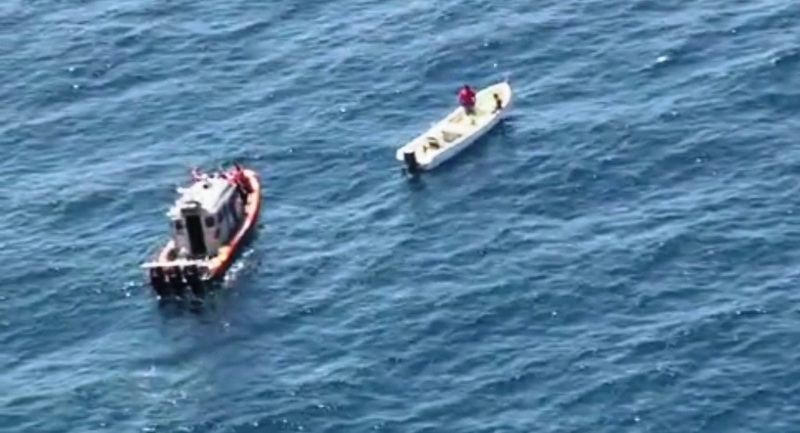 The Mexican fishing craft was towed back to the South Padre Island Coast Guard station where its four crew members were turned over to U.S. Customs and Border Protection officials. "Although the red snapper season in federal waters started today (June 1), it wasn't meant for foreign vessels without permits," said Cmdr. Daniel Deptula, the response officer at Sector Corpus Christi, in the news release. "It appears they stole the daily equivalent of approximately 225 licensed citizens, provided the fish were legal size. Instead, it is another deliberate and significant violation of the Magnuson-Stevens Act with a maximum civil penalty of $140,000." The big seizure of poached red snapper comes at a time when tensions are already running high between the state of Texas and federal fisheries officials. The two sides have been embroiled in controversy for several years over the continuing reduction in season length of the snapper season in federal waters from 77 days in 2010 to only nine days this year. That's down from an originally proposed 40-day red snapper season in federal waters this year before a commercial fisherman led lawsuit forced further reductions. The Texas Parks and Wildlife Department says that in the Lone Star State's coastal waters (less than nine nautical miles from shore), the season on red snapper is open year-round with a four-fish bag limit and a minimum size limit of 15 inches. But regulations in federal waters (greater than nine nautical miles from shore) differ from state regulations. This year, the recreational season in federal waters will run June 1-9 with a two-fish daily bag limit and 16-inch minimum length limit. While specific dollar figures for red snapper fishing in Texas aren't available, the species is a valuable contributor to the state economy. TPWD reports that overall retail sales (direct expenditures) by Texas saltwater anglers in 2011 were some $1.1 billion. The agency says that those expenditures led to a total economic impact for Texas of $2 billion dollars that same year. Overall, saltwater angling supports the equivalent of 16,819 full-time jobs in Texas and generates more than $107 million in state and local tax revenue according to TPWD. And that's in addition to $144 million garnered from federal tax revenue connected with saltwater fishing activities. It goes without saying that the red snapper is a valuable species in Texas and in nearby federal waters. Because of that, should anglers witness suspicious or illegal fishing activity in Texas state waters (out to nine miles offshore), they are urged to contact the Texas Parks and Wildlife Department's “Operation Game Thief” hotline at 1-800-792-GAME (4263). For all other suspicious or illegal fishing activity occurring in U.S. federal waters (out to 200 miles offshore), anglers are urged to contact the U.S. Coast Guard at (361) 939-6393.